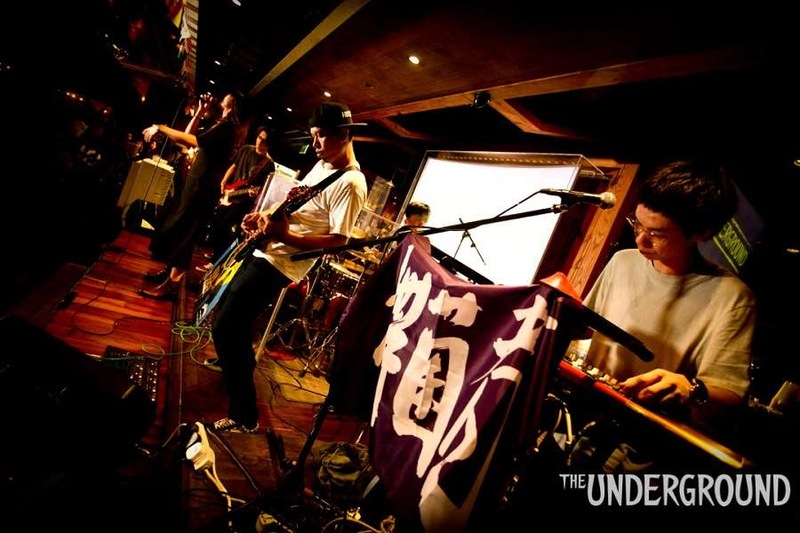 Carrier’s second Underground performance (after Sub Terra #3) saw the Hong Kong supergroup throwing their hat into the ring to win an Envol and Macadam festival slot. The third to perform out of five acts, the group attacked their primetime slot with an infectious energy. Musically, the band was nearly impossible to pigeonhole, veering between metal, disco, classic rock, and chart pop. This made for an interesting buffet of sounds, but also made such a short set feel disjointed, like the band was throwing all genres at the judges to see what would stick. First song 硬仗 was low and ominous, with a distinct metal feel, topped off by rasping, growling vocals from singer (and notable TV actress) Lung Siu Kwan. Based on that first song, Carrier could have been perceived as a heavy metal group – but they had lots more up their sleeve. The dark opener segued into the slap bass intro of 我地. Lung strutted the stage with sassy, Canto-pop attitude, while guitarist Sugmakho Mak blended the disco dexterity of Niles Rodgers with the funk rock of Red Hot Chilli Peppers. Competition may have been fierce at the Planetrox final, but Carrier showed no sign of nerves, and instead looked like they were having fun. Keyboardist Ken Au looked particularly joyful on stage, but, unfortunately, he was virtually inaudible in the mix. Vincent Ah Po showed a lot of talent, but his volume sacrificed the nuances of the other instruments. Again, on the rock-flavoured piece 去吧, Lung’s vocals were exceptional, but she was forced to compete in the mix with the much heavier rhythm section, and Mak’s twinkly arpeggios were also hard to hear. 有病 began with a ramshackle march of drums and Ken’s tambourine. During the verses, the guitar tone drew from Foo Fighters, but the chorus was much more jolly and pop-oriented, like Kelly Clarkson’s early material, with a touch of Chochukmo’s instinct for a catchy indie melody. Mann Tse’s big, overarching bass riffs held the foot-stomping piece together before a slick wah-wah pedal outro. Sugmakho’s held on to the guitar distortion for closer 快樂嗎, which channeled Paramore in its “woah” chorus. A clap-along section worked the crowd and the band members fed off that energy, jumping in unison to the sound of anthemic guitar trills. The performers’ consistency was spot on, despite the varied genre influences and a challenging sound mix. Carrier had one of the most charismatic, versatile and self-assured lead singers and played some of the most original-sounding songs of the night, but there was a sense of untapped potential, leaving judges feeling slightly underwhelmed. Bands with such eclectic sounds tend to struggle finding their niche at Battle of the Bands-style events, but we’ll look forward to catching Carrier again soon at one of their full-length solo shows. The headliners for tonight was the band Carrier, a Hong Kong canto-rock band that was lead by Lung Siu Kwan. I heard a rumour that she was semi famous and had done some acting on TV. She was surrounded by excellent musicians who you could have mistaken for a house band that played for TVB. I wouldn’t be surprised as these guys exudes so much stage presence that even their set up was interesting to watch. I don’t mean I couldn’t stop ogling the female vocalist who is a stunner! Not only that, the guitarist was very charismatic and he sported a Grestch guitar which sparked some people to wonder whether they were going to play some rockabilly. It turned out that the guitar was just for show and he could play anything he wanted. Lung Siu Kwan sang in Cantonese, hence my Canto-rock/pop label. Their first song, 我哋, tantalized everyone’s taste buds with synth keys and the sweet sound of the wah pedal. This was Canto-rock at its best supported by strong female vocals. Their stage act was super polished and they played with the confidence of a seasoned band. Up next was a slower song that began with the drums and was joined by some soft vocals. 雨傘花 was the kind of song that you would hold hands and sway to the music. The pace picked up again with 有病 which was the kind of song that you just wanted to jump up and down to. The vocals in this song were quite quirky. I mean, I couldn’t understand what she was saying, but I wouldn’t be surprised if this song was used for a TV commercial. Kei on the keyboard wasn’t needed for this one, so he jammed along with the tambourine. I have never seen someone play the tambourine that damn good, it just showed that they were quality all-round musicians. The vocals continued to mesmerize me during 繼續追. It seemed like a love song and had a familiar tune to it. 繼續追 was a more upbeat song which the chorus of this song relied a lot on the slide synths. I could just imagine it used for the end credits of a cartoon series. Quite a few people got up and danced during this song. It was so contagious I even had to boogie. Carrier’s last song for the evening, 硬仗, was propelled again by the tender and sweet vocals of Lung Siu Kwan and undertoned by a gentle music accompaniment. I really enjoyed Fa’s guitar solo in this song as it was very dramatic. It was another song that could have been the theme song for a TV show. The fans that stayed until the very end took pictures with the band after the show. It was a really great show that topped off a nice evening with good friends and great music.